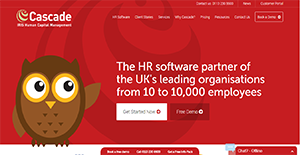 Cascade HR is an award-winning and industry-leading HR administration and integrated payroll software. It is used by top small to medium-sized companies in the UK with 10 to 10,000 employees to assist them in reducing the time spent on calculating payroll every 15 days and to manage all the required processes. With Cascade, organizations can expect that they can further streamline their existing workflows and improve their productivity and begin applying best practices in their lines of work. That is because Cascade is equipped with an intelligent HR system that offers task owners with step-by-step guidance for the smooth execution of jobs. Cascade provides organizations’ HR departments with features and tools that ease the burden of administrative tasks. An example is the application’s record-keeping capability, which keeps track of employee information such as their personal and contact details as well as working hours and absences and leaves. On top of that, It also brings the top management closer to their employees with staff survey tools. This way, they are able to get a grasp on their employees’ thoughts and act on significant issues. Furthermore, Cascade is an attractive software because it offers flexibility to its users. Various aspects of the application can be customized to suit an organization’s needs. Cascade does not only afford the HR with powerful administrative and reporting tools, it also offers them a chance to engage with their fellow employees. The application provides a way for this via the self-service portal, a feature that enables employees to manage their own profiles. This lets them update their data and view their work hours for optimum transparency. Moreover, the portal allows them to request leaves and log absences and gain permission from their immediate supervisors online. This reduces the waiting times for both parties and also affords line managers the ability to exercise better care and control over their team. Every organization has its own way of conducting tasks. This is something that Cascade understands, which is why the cloud-based software is equipped with a workflow module. Through this component, companies can create custom workflow processes and automate them at will. This drives efficiency and also encourages boosted productivity among employees. A key component of Cascade is its payroll module. This particular element is HMRC-recognized so organizations know they are utilizing a distinguished software. The component enables companies to set their own pay cycles, whether weekly, bi-monthly, etc. The same kind of flexibility is also afforded to the elements of remuneration and other checks. Also, Cascade makes it easier for the HR to provide employees transparency by enabling online pay slips. Cascade has three core modules plus the integrated payroll module. But aside from that, there are also several optional elements available that further streamlines work processes. These elective components allow companies to use a single platform for other aspects of HR such as recruiting, onboarding, training, and more. If you are considering Cascade HR it might also be sensible to examine other subcategories of Best Applicant Tracking Software gathered in our base of B2B software reviews. Enterprises have diverse wants and requirements and no software solution can be perfect in such a situation. It is pointless to try to find a perfect off-the-shelf software product that meets all your business needs. The intelligent thing to do would be to customize the solution for your specific needs, worker skill levels, finances, and other elements. For these reasons, do not rush and pay for well-publicized popular solutions. Though these may be widely used, they may not be the ideal fit for your particular wants. Do your research, check out each short-listed system in detail, read a few Cascade HR reviews, speak to the vendor for explanations, and finally settle for the product that provides what you want. How Much Does Cascade HR Cost? We realize that when you make a decision to buy Applicant Tracking Software it’s important not only to see how experts evaluate it in their reviews, but also to find out if the real people and companies that buy it are actually satisfied with the product. That’s why we’ve created our behavior-based Customer Satisfaction Algorithm™ that gathers customer reviews, comments and Cascade HR reviews across a wide range of social media sites. The data is then presented in an easy to digest form showing how many people had positive and negative experience with Cascade HR. With that information at hand you should be equipped to make an informed buying decision that you won’t regret. What are Cascade HR pricing details? What integrations are available for Cascade HR? If you need more information about Cascade HR or you simply have a question let us know what you need and we’ll forward your request directly to the vendor.